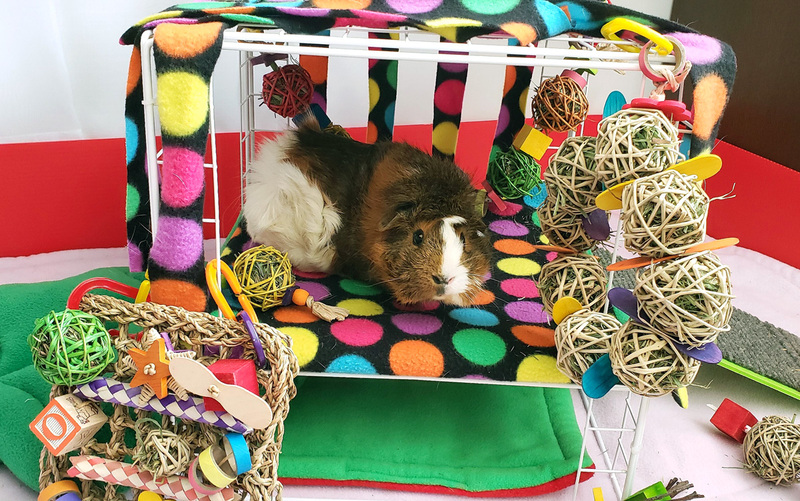 Let your pigs have something to run under, hide under, run over, hang out on top of, munch on yummy toys, and just chill! 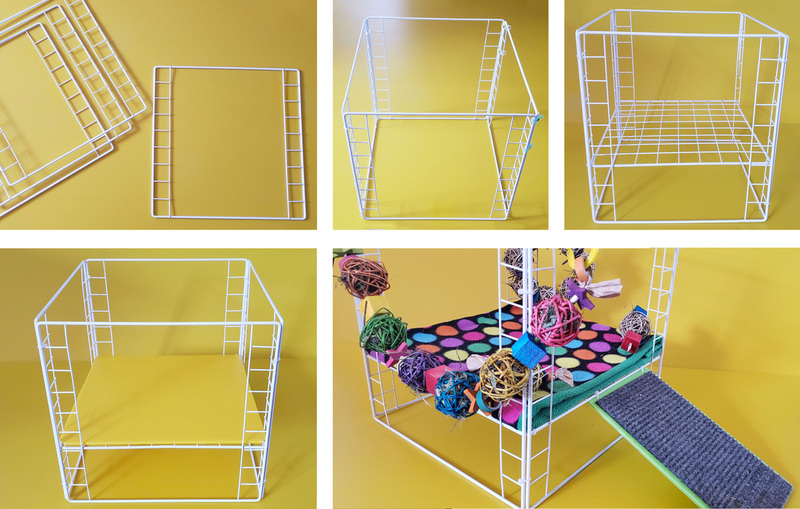 You can keep it simple and flexible and collapsible for easy storage when not in use, or make it a bit more permanent by cable-tying everything together. The key is using our Cagetopia Door Grids. They are great for this because they give strength and support without blocking their run-around space. You can easily make a nice hang-out and play platform by adding a regular grid inside and that helps secure it as well. 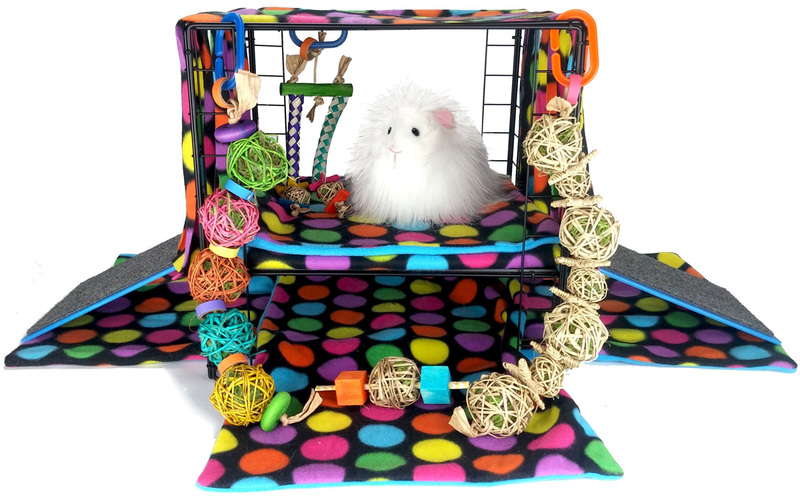 Add a top, regular grid and drop in a Fleece Forest and toys from our sister store, the Guinea Pig Market. Lots of fun for floor time. Add multiple ramps, add two square units together. Oh my, the possibilities are endless! Since they tend to hang out and potty more underneath, you want to cover the bottom Door Grid wires (the ones running flat across the bottom) with fleece. It doesn't have to be perfect. Two Fleece Flipper Cases laid across each other on the bottom work well. You can use a simple square piece of Coroplast if you happen to have some, or cut one of our fleece flipper panels in half to cover the shelf grid for them. Then use a Fleece Flipper case to go over it and fold it half for more cushion support. I've tried this setup in a cage, by the way, for quite a long time actually. They will always hide and hang out under it, and the mess underneath the PlayStation can get pretty darn grody. Also, it really ends up taking up a lot of room in the cage. You end up having to lift it out to clean really well under it. But, for Floor Time, it's a great item! Just as long as it isn't a primary hideout for them all the time, it should be fine and totally manageable. Here I have a Lettuce Leaf plush bed from the Guinea Pig market as a soft landing on the other side. You can use ramps or build up some fleece items for flexibility on getting up and getting down from the hangout level. You can get very creative with our Cagetopia Specialty Grids. Pick some up today and create your Floor Time Cagetopia. You can always find uses for the grids. Share your creations with us!